"Stop privatization!" "Strengthen quality public services!" These were the slogans chanted by some 3000 thousand workers who braved the snow and cold weather to gather at Seoul Plaza last December 8 in protest against President Lee Myung-bak's end-of-term dive to privatize public services. Sang Moo Lee, President of the Korean Public & Social Services and Transportation Workers' Union .KPTU), captured the thought of the crowd aptly when he stated, "More than this cold weather, it is the biting wind of privatization wrecking havoc in the lives of common people that makes us shiver," in his opening speech. Public sector privatization, promoted by international economic institutions like IMF and World Bank, has become a global trend over the last thirty years. Since the advent of the global financial crisis this trend has accelerated with government use claims about the need for austerity to justify the sale of public corporations and outsourcing of public services. As was recently recognized at the 29th Congress of the global union federation Public Services International (PSI), however, "privatization. . . (is) often used to drive down wages and conditions of workers and generate profit for the private sector" and, by raising costs and limiting access, is depriving "millions of people#46; #46; #46; of their fundamental human rights" (PSI, Programme of Action, 16, 31). South Korea is no exception to the global trend. Over the past several years, successive administrations have sought to privatize utilities, rail transport and other public services. They have, however, met determined resistance from South Korean labor unions, many of whom are members of PSI. 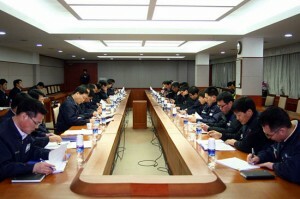 Most notably, in 2002 a joint strike by the Korean Power Plant Industry Union, the Korean Railway Workers' Union and the Korean Gas Corporation Union succeeded in stopping the Kim Daejung administration's plans for direct privatization in these areas. For many years afterwards, the government was unable to pursue blatant sale of public corporations, although it did pursue privatization through roundabout means, such as allowing the entry of private companies into utility provision and the contracting of local public services to private companies. With the advent of the Lee Myung-bak administration, however, privatization got a second wind. Under his policy of 'the advancement of public enterprises', Lee sought to facilitate the entry of private corporations into gas distribution and expand privately owned power plants, calling these changes the 'introduction of competition to eradicate irrationality' in public corporation management. With his term coming to an end, Lee has sped up privatization efforts even further. Last February, the right to operate Cheongju International Airport for the next 30 years was contracted to a partially U.S.-owned holding company for the bargain price of 25.5 billion won .roughly 15 million USD). The Lee administration has also been pursuing sale of shares of the Incheon International Airport Corporation and recently announced plans to sale Incheon Airport's duty free shops to private capital. Recently, it also announced removal of legal and structural barriers to make way for private operation of the KTX rapid transit train from Suseo to Busan. The construction of the rapid-transit rail line and the private railway operator's use of the government-owned tracks would be subsidizing with taxpayers' money. In as much as private companies are sure to put money-making above security and public access, airport and rail privatization has been heavily criticized as sacrificing safe and user-friendly transport for capitalist profits. Workers and community members have also been fighting the administration's plans to allow for-profit hospitals and the contracting of water provision to private companies fearing the reduction of access to quality and affordable healthcare and clean drinking water. The protest on December 8 was organized by several coalitions of labor unions, social movement organizations and community groups, which have been formed to fight privatization on all fronts. Unfortunately, the work of these groups is far from over, especially considering the recent election of the conservative Park Geun-hye as South Korea's next president. While Park shied away from the subject during her election campaign due to negative public opinion, her past statements have indicated her support for privatization, and numerous news outlets have predicted that pro-privatization forces in the administration will gain confidence from her victory. Moreover, clauses in the U.S.-Korea FTA, pushed through the National Assembly last year, which allow foreign investors to sue the government for 'anti-competition' policies, will make privatization irreversible once it is achieved. The anti-privatization struggle will have to get several notches stronger in 2013. To make this possible, unions and other anti-privatization forces must begin putting forth concrete alternatives to privatization that make the provision of quality public services financially and structurally viable. They must also remember the power they wielded in 2002 when public sector unions in three industries went on strike together, and seek to connect knit their struggles in to a global anti-privatization movement. Only with unity and determination will the labor movement be able to defeat privatization and defend the people's right to quality public services during the next 5 years of conservative rule. In South Korea, public schools are among the many public sector workplaces that employ a high percentage of irregularly (precariously) employed workers. Public school irregular workers account for more than 40% of the total irregularly employed public sector irregular workforce. These workers, who serve school lunches, run school libraries, aid science labs, assist disabled students, teach physical education, run after-school programs and perform administrative functions, are directly and indirectly responsible for the education of Korea’s elementary, middle and high school students. Nonetheless, for several years no law has existed to define their status. This has meant that various education authorities including the Ministry of Education, Science and Technology, local offices of Education and the administrators of individual schools continuously attempted to pass responsibility for their working conditions off to one another. Under individual contracts with school principles, irregular education support workers, the vast majority of who are women, have suffered from low wages, high levels of work intensity and an overall lack of respect at work for the last twenty years. Any time there is a decrease in school enrollment or a lack of funds, these workers face the threat of dismissal. They are also regularly required to do personal tasks for superiors while only receiving a fraction of the salaries made by school administrators, who hold the rank of public servant, and regularly employed schoolteachers. While teachers and public servants are given bonus and pay raises based on experience, irregular education support workers have no pay scale. This means that no matter how many years they have worked, their salaries remain the same. Public schools, which should model the values of equality and respect, are instead sites of gender discrimination and the violation on labor rights. The vast majority of education support workers went without union representation for many years. This changed in 2011 with the election of progressive education commissioners in Seoul, Gangwon Province, Northern Jeolla Province, Southern Jeolla Province and Gyeonggi Province. At this time, workers’ desire for change, the potential for forward movement represented by the education commissioner elections, and the efforts of unionists came together in a massive organizing drive. Union membership grew to 40,000 in roughly a year. While these numbers are impressive, this organizing effort has not been with out its problems. Various factions within the labor movement have engaged in competitive organizing such that education support workers are now members of four different unions – the Irregular Education Support Workers Division of the KCTU-affiliated Korean Public & Social Services and Transportation Workers’ Union (KPTU), the KCTU-affiliated National Irregular Education Support Workers’ Union, the KCTU-affiliated Seoul General Union and the non-affiliated Korean Women’s Union. Clearly, overcoming divisions and building unity is an urgent task. The main demand of education support workers is that local offices of education and the Ministry of Education, Science and Technology acknowledge their responsibility as education support workers real employers and engage in collective bargaining with them. This is seen as the best way to change the current irrational system, under which education support workers are contracted with, and therefore tied to the will of individual school principles. Education workers have had some success in getting this demand met. In February of 2012, the Ministry of Employment and Labor stated its opinion that, “The responsibility for collective bargaining with irregular education support workers’ unions falls with the relevant offices of education.” The Lee Myung-bak administration has also acknowledge that education offices should be seen as the real employers of education support workers. Local education authorities have continued to avoid negotiations, however. To up the pressure, the Korean Women’s Union, the KPTU Irregular Education Support Workers Division and the Korean Irregular Education Support Workers’ Union formed a coalition and began planning a collective response. Leaders of each union carried out a hunger strike and sit-in protest in front of the National Assembly from October 24 to November 3. On the last day of the sit-in protest 10,000 workers gathered in Seoul for a massive protest, at which they called for legislation to regularize their status as public sector education workers, the introduction of a pay scale and direct employment under the Education Commissioner. A week later on November 9, 16,000 union members at 1400 schools around the country carried out the first ever strike of education support workers, followed by a second strike on November 23 in Northern Chungcheong Province. Protests continued throughout December. Unfortunately, outside of the 10 regions where progressive education commissioners are in office, education authorities continue to refuse to negotiate. The strike carried held on November 9 was the first ever strike of education support workers in Korean history. The fact that education support workers have organized and gained the confidence to strike so quickly is an amazing achievement. The struggle of education support workers is also significant as an example of women workers’ collective action. Education support workers succeeded at the end of 2012 in minimally improving their conditions and also getting a budget proposal to cover the introduction of a pay scale introduced in the National Assembly. Sadly, this proposal was thrown out in the wake of conservative Park Geun-hye’s election as South Korea’s next president. Nonetheless, the struggle in 2012 was a giant leap forward, and has created the basis for an ever more determined struggle this year. The expansion of membership, unity among the various education support workers’ unions, achievement of regular employment and improvement of working conditions are all important tasks for 2013. Roughly 40,000 directly employed regular workers and 10,000 irregular in)house subcontracted workers work for the Hyundai Motor Company. The in)house subcontracted workers, who do the same work as regular workers inside Hyundai Motor plants, but are formally employed by other companies, are in fact no different from temp agency or ‘dispatch’ workers. Under South Korean law, dispatch employment is prohibited in the manufacturing sector. By law, therefore, Hyundai Motor should directly employ and ‘regularize’ these workers. Hyundai Motor management, however continued to refuse the regularization of the irregular worker in its factories. In 2003, Hyundai Motor irregular workers formed their own union and have since fought to win regularization and the abolition of illegal dispatch employment. Currently, irregular worker union chapters affiliated to the Korean Metal Workers’ Union (KMWU) exist at the Hyundai Motor plants in Ulsan, Asan and Jeonju. In 2004, the Ministry of Labor found that 127 in)house subcontractors employing 9,234 workers at Hyundai plants were in fact illegal dispatch agencies. Energizes by this ruling, the Hyundai irregular workers struggle moved forward with full force. This struggle involved the occupation of Factory 5 at the Hyundai Plant in Ulsan, the self)immolation of one worker and the self)hanging of another, and yet the company did not waiver in its position. In 2010, a historic Supreme Court decision found that Hyundai Motor irregular worker Byeong)seung Choe was an illegally dispatched worker and should, therefore, be regularized. Still, Hyundai management refused to budge, calling the verdict “not the final decision” and even going so far as to make a second appeal to the Supreme Court. 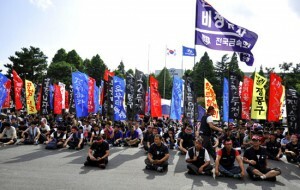 In response, the Hyundai irregular workers occupied Factory 1 of the Ulsan Plant from November 15 to November 25, 2010 demanding regularization. 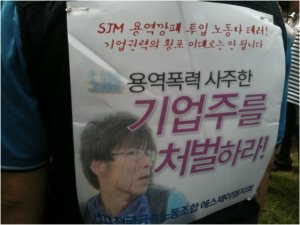 At this time, irregular worker In)hwa Hwang also set himself on fire in protest. Hyundai Motor’s efforts to crush the irregular workers’ struggle have been extreme. Over the last ten years some 200 workers have been fired and the company has made claims for damages and provisional seizure of assets against union members worth several billion won (several million dollars). It has also sent managers and hired thugs to violently suppress protests. Finally, in February of this year the Supreme Court issued its final verdict finding that “Hyundai Motor has the responsibility to directly hire union member Byeong)seung Choe, given that he is indeed an illegally dispatched worker.” Hyundai, however, refused to follow the Supreme Court’s decision, claiming “because Byeong)seung Choe has been dismissed, the company has no obligation to rehire him,” and filing a complaint with the National Labor Relations Commission (NLRC). The NLRC found that Choe had been unfairly dismissed, but Hyundai has not rehired him, nor has it regularized any other in)house subcontracted workers. The main content of the Supreme Court decision is as follows: “Due to the particular characteristics of Hyundai Motor’s automated)flow production method, which uses a conveyer system, the various steps of the manufacturing and assembly process must be carried out continuously without stop and, thus, cannot be independent. Given the fact that the in)house subcontractors in fact dispatch their workers to Hyundai Motor and that these workers are directed and supervised by Hyundai Motor, the contract between the in)house subcontractors and Hyundai Motor falls in the category of a contract for dispatch labor.” Thus, the Supreme Court recognized in)house subcontracting as illegal dispatch. In addition, an amendment to the Act on the Protection, Etc. of Temporary Agency Workers, which went into effect on August 2, 2012, stipulates that in cases where illegally dispatched work is verified, the parent company must directly employ the related workers even if they have only worked for a single day. The Ministry of Labor and Supreme Court decisions, the new revision of the Temporary Agency Worker Act and the general state of public opinion are all highly disadvantageous to Hyundai Motor. Given this situation, Hyundai Motor finally put forward a proposal to directly hire 3,000 of its in)house subcontracted workers as new employees by 2016. 3,000 hires, however, is far less than the full number of in)house subcontracted workers. Moreover, 2,800 regular Hyundai workers are scheduled to retire by 2016. This means that Hyundai Motor’s proposal amounts to little more than filling the slots vacated by retiring regular workers with some of the irregular workers, excluding those who have been dismissed. The slots left open by the irregular workers who become directly employed would simply be filled by more in)house subcontracted workers. In other words, Hyundai Motor’s proposal amounts, not to the regularization of irregular jobs, but the passing of irregular jobs from one set of workers to another. It is Hyundai Motor’s plan to change the role of in)house subcontracted workers so that they will not qualify as dispatch workers by the above definition and, thus, free itself of the debate on illegal dispatch. At the same time, Hyundai Motor has carried out a campaign of terror against the irregular workers. In one recent incident, managers and hired thugs beat and kidnapped officers of the KMWU Hyundai Motor Irregular Workers Branch, later leaving them outside factory grounds. The irregular workers’ struggle has continued in the face of these hardships, receiving considerable solidarity from unions around the country who have gathered in front of the Ulsan plant to hold solidarity protests. Meeting with the irregular workers’ union through the ‘Parent Company)Subcontractor Workers Alliance’, the regular workers union made a promise to work collectively to achieve the regularization of the Hyundai irregular workers. Last April, the Alliance put forth the following six demands: 1) regularization of all irregular workers employed by in)house subcontractors; 2) immediate withdrawal of all charges, arrest warrants, dismissals, claims for damages and provisional seize of assets against in)house subcontracted workers in relation to their struggle; 3) a public apology for the illegal acts and repression against the irregular workers; 4) an agreement between labor and management to discontinue any further use of irregular workers, 5) an immediate end to structural adjustment related to irregular workers, and 6) adherence to labor laws with regards to the three irregular workers’ union chapters and non)interference in union activities. In fact, however, the regular workers union has come under heavy criticism failing to stick by these demands. Engaged with Hyundai management around its own collective bargaining, the regular workers union accepted the proposal for 3,000 new hires. It even carried out a campaign to convince the irregular workers to go along with the proposal, leading to divisions among the irregular workers. Worrying that if they persist in struggle they might not even win fulfillment of the promise of 3000 new hires, and some members have left the irregular workers union. On August 29, the Hyundai regular workers union reached an agreement in its collective bargaining with Hyundai without settling the issue of the irregular workers. The content of the agreement is as follows: 1) An increase in basic wages by 98,000 won, a bonus of 350% of basic wages plus 9 million won and an incentive bonus of 150% plus 600,000 won (including a 100,000 won tradition market gift certificate), for a total increase of 27 million won per person; 2) a two)week trial of the two daytime shift system (replacing late night work), beginning on January 1, 2013 and full implementation at all plants based on one 8)hour and one 9)hour shift. The issue of regularizing irregular workers was deferred to a future special negotiation session. In the bargaining session that took place beginning at 5:00pm on August 29, 4 members of the union bargaining committee walked out in protest against the company’s proposal. That night, the 4 bargaining committee members and some 50 Hyundai Motor Branch delegates and activists held a protest in front of the factory opposing the agreement, which lasted until roughly 12:00am. Their criticisms focus on the fact that the agreement failed to include a provision for an increase in employees to accompany the implementation of the two daytime shift system, meaning an increase in work intensity, and the fact that the bargaining committee had agreed to the belated reinstatement of fired workers in the first quarter of next year. The results of the union vote on the agreement reflected this atmosphere of discontent. The agreement barely past with a vote of 52.7% in favor. Hyundai Motor’s profits in 2011 were 4.8 trillion won ($4.2 billion) a 36% increase over profits in 2010 (3.5 trillion won). Nonetheless, company management has maintained its position that, while it might give a bit more to regular workers, it will never regularize irregular workers. By so doing, it has succeeded in creating division between the regular and irregular workers. Despite the agreement to revisit the irregular worker question in special negotiations, hopes are not high that the regular workers union will give the needed support to the irregular workers’ struggle now that their collective bargaining agreement has been reached. The irregular workers union must now regroup and preparing for the special negotiations. To do so, the union must succeed in re)energizing its members to struggle and beat back company repression. It must also find a way to build common cause with active members of the regular workers union. Currently, the irregular workers union is planning a new struggle for the end of September and beginning of October. In the end, the struggle of Hyundai irregular workers, is the struggle of all in)house subcontracted workers South Korea. The solidarity of the labor movement and all progressive forces is, therefore, absolutely essential. On June 4, 2012, the South Korean Ministry of Employment and Labor MoL) announced a new policy entitled "Policy for Improvement in Foreign Workers' Change of Workplaces and Prevention of Broker Intervention". This policy, which went into effect on August 1, changes the procedures used by local MoL job centers in processing migrant workers' applications to transfer workplaces. While the policy's title sounds good, it actually makes it incredibly difficult for migrant workers to change employers, even in cases where they face extremely severe labor rights violations and poor working conditions. The policy change has sparked severe concerns by migrant workers' advocates and the beginnings of a potentially powerful struggle based on the participation and leadership of migrant workers themselves. Documented migrant workers in South Korea are regulated by the Employment Permit System .EPS). Under this system, migrant workers, who receive short-term residence permits, can change workplaces a limited number of times, but generally need the permission of their employers to do so. If a migrant worker who leaves one workplace cannot find new employment within three months he/she loses his/her residence status, becoming undocumented. Even without the new MoL policy, the limitations the EPS puts on changing workplaces means the workers are often stuck with abusive employers with no options except to endure the situation or leave the workplace without permission, thus becoming undocumented. The new MoL policy makes the situation even worse. Whereas in the past, migrant workers seeking new employment were given a list of potential workplaces, now only employers receive a list of migrant workers looking for job. This means that migrant workers can do nothing more than sit at home hoping for a call from a prospective employer and will have a hard time refusing a job offer no matter how poor the working conditions for fear of not getting a second one. As such, the policy will further discourage migrant workers from leaving employer who violate the labor law in the first place, effectively forcing them into slave labor. The policy is a clear violation of the right to free choice of employment, guarantee in Korean labor law and ILO Convention 122, which South Korea has ratified. Recognizing the problematic nature of this policy, the Migrants Trade Union, the Korean Confederation of Trade Unions and migrant worker support centers across the country formed a "Committee to Repeal the Slave Labor MoL Policy". This Committee has been actively fighting the policy since mid-July. Even more important, however, has been the massive participation of previously unorganized young migrant workers who, recognizing the significance of the policy for their daily lives, have started to come out to meeting and protests in force. Nearly 700 such workers, mostly from Cambodia, showed up at a rally on August 19, having seen advertisements for it on the internet or hearing about it by word of mouth. These workers held an impromptu discussion about what to do next at the rally site and then come out for a meeting the following weekend to discuss detailed plans. This level of voluntary participation by unorganized migrant workers is unheard of these days in the Korean migrant workers movements, which has been weekend over the last several years by massive immigration crackdowns and targeted repression. The struggle against the MoL's new policy is significant for several reasons. 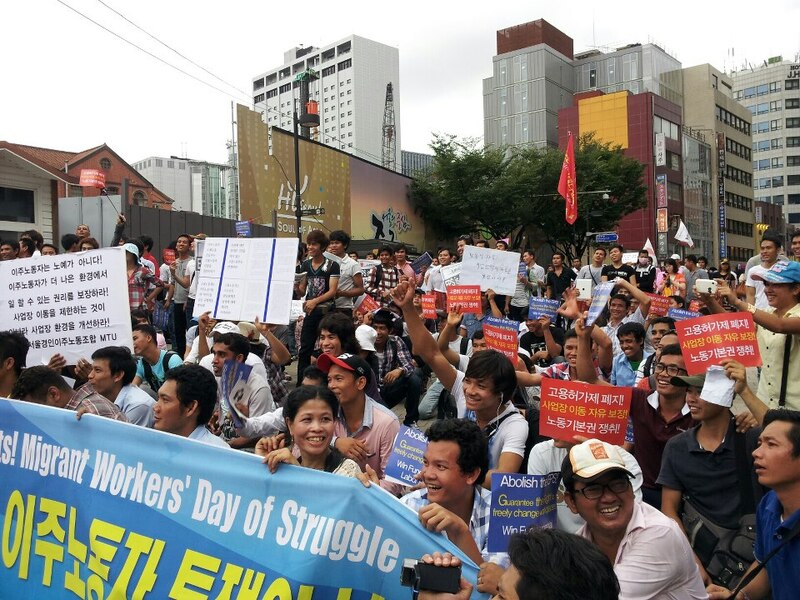 First the policy represents a trend towards the increasing repression of migrant workers rights, even as the South Korean government and capital admit that migrant labor is essential to the Korean economy. Secondly, the struggle has brought together and energized organizations working on migrants rights around the country. Finally, and most importantly, this struggle presents a desperately needed organizing and leadership development opportunity. It will be up to union officers and activists to seize this rare chance to revitalized a migrant worker-led migrant rights movement. Don't make a sour face. You know things are difficult for everyone. And you know you have comrades working with you for a more joyful day. When you feel alone, just look around you. All of these people are our comrades. The road we are traveling is not going to be easy. And there will be times that we are brought down by repression. Until the day of workers' liberation, advance, ad! vance! Let's advance! Directly after the 'Great Workers' Struggle of 1987' social movements in South Korea developed rapidly, both quantitatively and qualitatively. The diverse movement forces, however, could not agree among themselves about political strategy, a problem that was exacerbated by the collapse of socialist governments in Eastern Europe and the Soviet Union. A downturn in the movement came with the turn of the decade. At this time, a self-reflective atmosphere spread among progressive forces. Instead of the solemn and majestic marching songs of the 1980s, lighter and more speculative songs became popular. 'Don't Make a Sour Face', which was released in 1991, began this trend. Its light and quick tempo was a bit shocking to listeners, who were accustomed to the heavy mood and slow tempos of the songs of the 1980s. The lyrics, which propose "the rediscovery of the existence of the comrades around you," are quite trivial compared with the "grand" songs of the past decade. But in an era in which everything was obscure, 'comrades' were the only concrete thing that was left. The song became unexpectedly popular after a celebrity did a remake of it in 2003 with a few changes to the lyrics. Now the song can be heard not only in movement spaces, but also in everyday life. The movement band 'Ggottazi' .http://ihopesong.tistory.com) singing 'Don't make a sour face'. A performance of "Don't make a sour face" at a community festival. 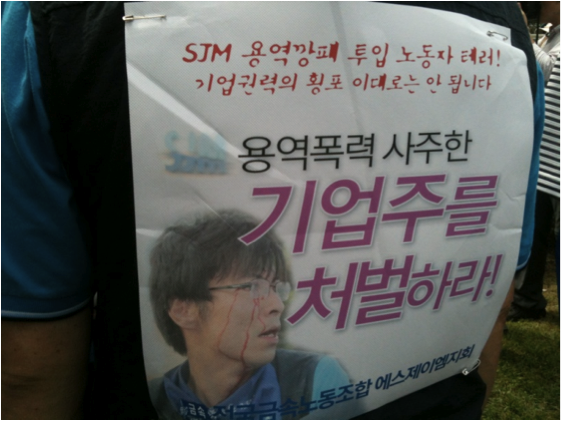 At 5 a.m. on July 27, 2012, the opening day of the London Olympics, 200 armed men raided the SJM factory in Ansan where members of the Korean Metal Workers’ Union SJM Chapter were staging a sit-in protest. A female union member called the police for help 4 times before they finally arrived. When they finally got to the factory, the police did nothing to stop the armed gang as it meted out violence against the union members. In all 35 union members were injured, 10 seriously. Following the incident images and video footage of the scene circulated widely through social media. The strikebreakers who descended on the SJM workers that day were employed by Contactus, a security contractor specializing in quelling protests. Contactus owns not only 1,000 sets of riot police equipment, but also German-made water cannons. According to its website, the company can dispatch up to 3,000 individuals at one time and prefers offensive - as opposed to defensive - suppression tactics. It has been revealed that the chairman of Contactus is a staff member of the ruling New Frontier Party and that the company has a record of bribing police officers to win their cooperation. The fact that Contactus has been known to have its employees hired by its clients so as to disguise them as union members has caused a particular stir. Contactus even had plans to launch two media channels. Hiring security contractors is becoming a common method for quelling strikes and bursting unions in South Korea. In the past, capital organized managers and non-union members into company strikebreaking squads. Now, however, the violence – like everything else – is being outsourced. Capital now seeks to exclude even state power from its domain by contracting private armies. In other words, capital is replacing state authority with its economic power, doing so with the consent of the police and conservative politicians. This collusion is making Korean workers into 21st century slaves. Due to the public attention to this particular case, Contactus lost its business license, while 4 Contactus managers and the SJM director who orchestrated the raid are being prosecuted. Dozens of similar security contractors, however, are still in operation and vigorously expanding their businesses. Private violence is now a prosperous industry in South Korea. On June 25, the Cargo Truckers Solidarity Division of the Korean Public & Social Service and Transportation Workers Union .KPTU) went on strike demanding an increase in freight rates, the waving of fuel taxes, the implementation of a standard freight rates system and unionization rights. For five days, logistics bases across the country experienced major delays due to the strike. The strike end on June 29, with the cargo truckers winning a 9.9% increase in freight rates. While the rate increase was lower than had been hoped, the strike was successful in winning a promise from the Democratic Party to include the cargo tuckers' demands in its party platform. More importantly, the strike was instrumental in increasing public sympathy for cargo truckers, which forms an important basis for further struggle. 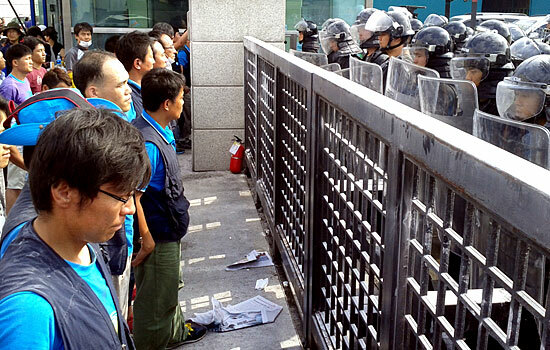 After an 85-days sit-in protest, cleaning and security workers at Hongik University finally forced the contract cleaning company Yongjin Sileob to recognize their union, the Seoul-Gyeonggi Public Service Branch of the Korean Public & Social Service and Transportation Workers Union .KPTU). Yongjin Sileob had established a yellow union, and was claiming the yellow union had the status of bargaining representative as an excuse not to recognize the KPTU union. Through their struggle, the Hongik workers forced Yongjin management to reach an agreement with their union on August 1. Under this agreement, the workers will be covered by the KPTU Seoul-Gyeonggi Public Service Branch's multi-workplace collective bargaining agreement, reached last April 19. Yongjin Sileob also agreed either not to seek a renewal of its contract with Hongik administration after it runs out in December, or to bargain faithfully with the union if its contract is renewed. At 12:00am on the night of August 4-5, Sang-gyun Han, former President of the Korean Metal Workers Union Ssangyong Motor Branch was released from Hwaseong prison after serving a three-year sentence. Han, who is loved and respected by the Ssangyong Motor union members and the Korean labor movement, was arrested after leading a 77-day factory occupation and strike against mass dismissals in 2009. He was greeted by a crowd of union members, students and activists holding a cultural event in front of the prison to honor his release. Han addressed the crowd saying, "Thank you. I promise to struggle even more fiercely in the future." Scattered, we will die. Wavering, we will also die. United as one, we set out towards victory. Even if our skulls are split. Scattered, we will die. Wavering, we’ll also die. *Kusadae – A band of anti-strike workers supported by management. Kusadae, which means “Division saving the company”, have been organized at many workplaces where labor disputes are occurring and have committed naked violence against striking workers. In June 1987, a great wave of civil protest against military dictatorship swept across South Korea. A general strike and workers’ struggles for building democratic trade unions followed. This period was known as the “Great Workers’ Struggle of 1987″ or the “7·8·9 Great Workers’ Struggle”). This massive wave of organizing symbolized the overcoming of defeatism that had plagued Korea’s social movement after the terrible massacre in Gwangju committed by the military in 1980. For workers, it was the first awakening, during which they gained dignity and class-consciousness. The need for cultural forms to express workers’ own stories was clear. ‘Strike Song’, composed in 1988, spread quickly to every workplace where a labor dispute was occurring and became one of workers’ favorite songs. At workplaces where trade union did not exist and management’s violence was severe, the song was sung to build solidarity among the workers. As the song, which has a powerful and solemn tone, depicts the moment workers go on strike, it has also become the opening song for workers’ collective actions. The composer, Hochul Kim, was a worker himself. He was one of the first to recognize that workers need songs for themselves during the Great Workers’ struggle of 1987 and became a father of workers’ music. He has composed over 100 songs for workers and the labor movement. You are currently browsing the People's Solidarity for Social Progress blog archives.